Crane Hello Kitty Humidifier Review & GIVEAWAY! Buy Now or Never Review! If you are in Utah, I just found out that Disney on Ice Celebrates 100 Years of Magic will be in Salt Lake City, November 14th-18th, and I'm soooooo excited (maybe even more so than the kiddos:)) ! 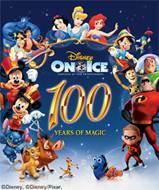 So come Be part of the festivities when Disney On Ice celebrates 100 Years of Magic comes to the EnergySolutions Arena in Salt Lake City from November 14 – 18! More than 60 of Disney's captivating characters and their unforgettable stories come to life in this commemorative celebration, produced by Feld Entertainment. In this lavish ice show, everyone's favorite sweethearts, Mickey Mouse and Minnie Mouse, take audiences on a fun-filled adventure, sharing memories with Disney friends including Goofy & Donald Duck; the beloved Disney Princesses; Buzz Lightyear & Woody; Nemo & Dory; Pinocchio & Jiminy Cricket; Belle & The Beast; The Incredibles plus many more – and magical moments from Disney’s Aladdin, Mulan and The Lion King. Beautifully choreographed skating, breathtaking production numbers, stunning costumes and toe-tapping songs will inspire fond Disney memories. Families can share this once-in-a-lifetime skating spectacular as Mickey and the rest of the gang take the audience on a whirlwind tour of favorite Disney moments. TICKETS: Ticket price levels are $16, $23, $37 (VIP) and $50 (Front Row). Opening Night tickets available for only $12 each (not valid on premium seating). All seats are reserved; tickets are available from the EnergySolutions Box Office and all SmithTix locations, charge by phone at 801-355-SEAT or 800-888-TIXX and online at www.smithstix.com or www.energysolutionsarena.com. I am SOOOO Excited about this great event I mean Who doesn't like Disney, and I know my family going to Disney on Ice Celebrates 100 Years of Magic will create such a good family memory for my little ones! So get your tickets before they are gone!